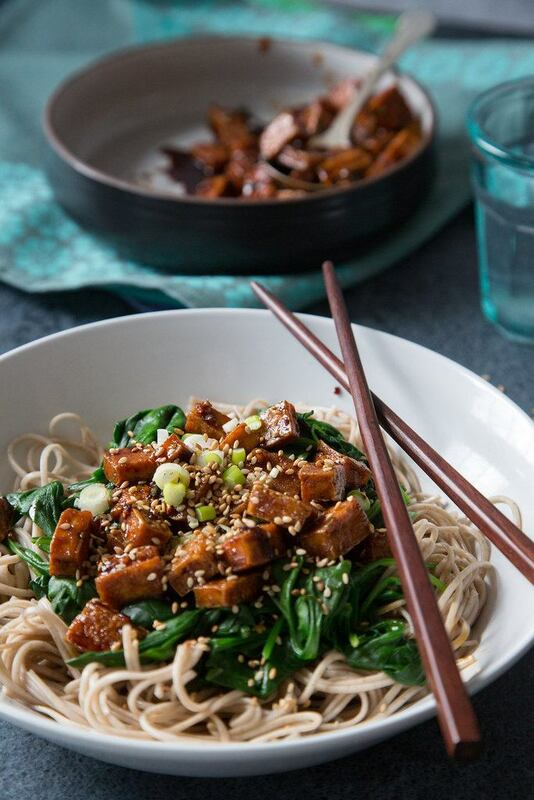 Tofu and teriyaki go together like, well, things that go together perfectly. 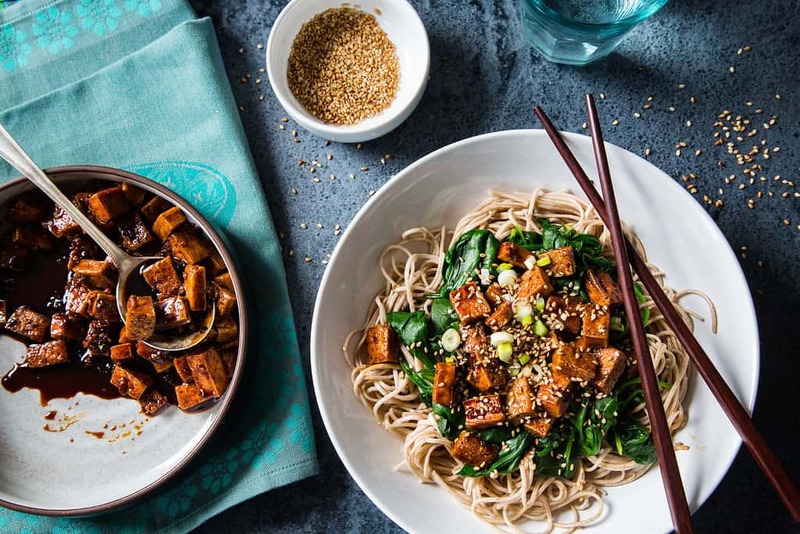 This dish is hands-down going to be your weekday, weekend, easy-anytime 30 minute bowl of deliciousness and final answer to anyone who says tofu is bland and pointless. One thing to make absolutely clear though: if you are not pressing your tofu, you need to get on that. 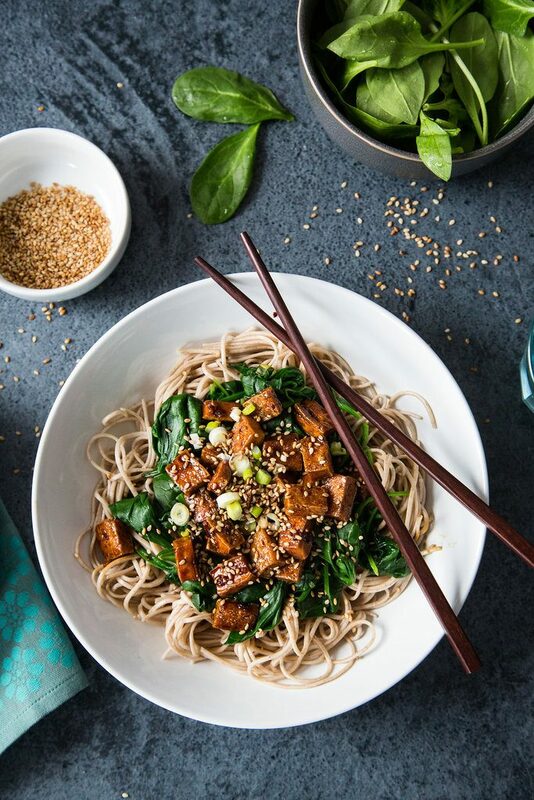 This dish involves high temperatures (think crispy tofu heaven) and sweet, caramelized and sesame flavors that are absorbed beautifully in pressed tofu. We have a quick guide here on what to look for in a tofu press and our top pick. Soba noodles, if you haven’t tried them, are my new favorite thing since my last favorite thing. The 100% buckwheat variety are gluten-free and incredibly healthy, and there is a slight nutty flavor to them which I’ve been experimenting with (more on that in the future). They do tend to clump together though, but that is a teensy weensy small price to pay. Bring water to a rolling boil and cook soba noodles according to package directions. When finished, remove and rinse under cold water. Set aside to drain completely, with some oil mixed in so as not to clump. While the noodles are boiling, heat a skillet or pan until hot. Toast the sesame seeds in a skillet or hot pan until golden. They can burn easily, so keep them moving! Once the sesame seeds are golden but not brown, remove and set aside. Heat 2 tablespoons oil in wok or large skillet over medium to high heat. Place the cubed stir fry in the pan and stir fry, turning every 2 - 3 minutes, until beginning to color. We want to finish the tofu in the sauce, but make sure it has a crispy enough layer to keep its shape before we do so. Add the cut green onions to the tofu in the last minute of frying. Pour in half the teriyaki sauce and fry fast for 30 seconds before adding the remainder of the sauce. Fry for another minute or two until the sugars have began to caramelize and it is turning brown and crispy. Remove from the pan. Throw mirin wine or water into the pan to quickly deglaze/remove the sticky bits. Add spinach and stir-fry quickly on a medium heat for 1 to 2 minutes, or until wilted. Add a little water if needed so it doesn't burn, as the pan will still be very hot. Divide noodles into two large bowls, topping with spinach and tofu. Garnish with the golden sesame seeds.